This set is ideal for woodworking, metal working and hobby and craft projects. 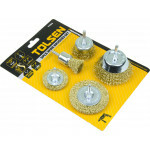 The accessories in this kit fit all standard rotary tools and are perfect for sanding, grinding, polishing buffing, sharpening cleaning and carving. The wooden case helps keep it all organized for you. Description of content may change without notice, we do our best to provide the most accurate description of this product. 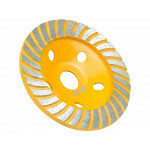 The Tolsen diamond grinding wheel is enduring and heavy duty to grind stone and concrete. Aggressive..
Brass coated steel wire brushes are a good general purpose brush, aggressive enough to clean badly r..